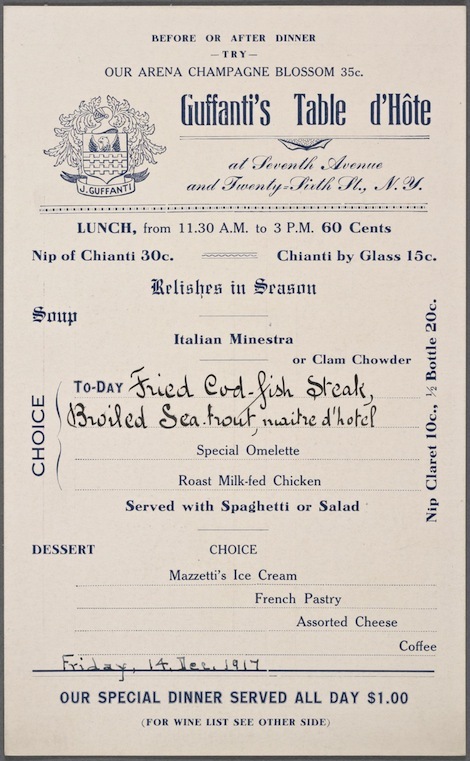 Fall down the rabbit hole of the New York Public Library's remarkable menu collection. To explore the eating habits of the past, one needs a few resources. Personal cookbooks provide insight into everyday culinary lives, but to see what people did when they wanted to treat themselves, one needs to look at menus. 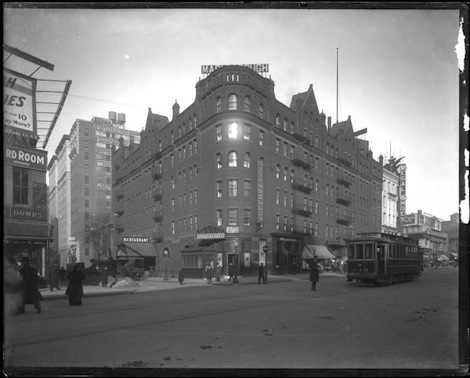 Located at Herald Square, Hotel Marlborough boasted a number of dining options like the Ladies’ Restaurant and the “Famous German Rathskeller,” both visible in this photograph from the New-York Historical Society’s Library collection. Given that this 1917 menu specifies, “Ladies are permitted to smoke after 3pm only,” my guess is that it comes from the Ladies’ Restaurant. 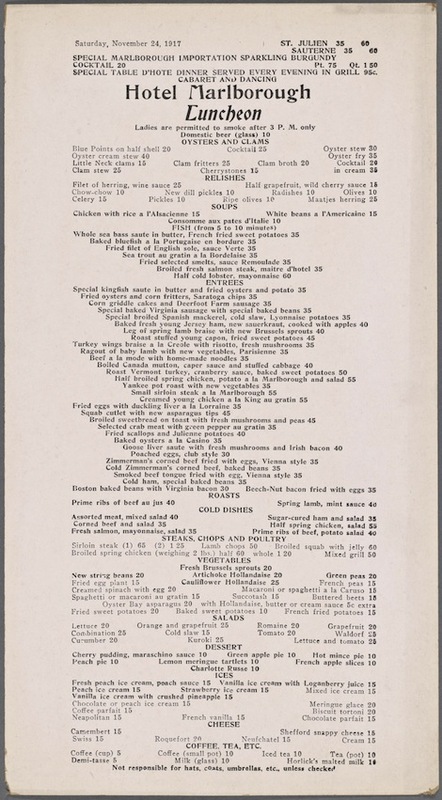 Dishes include standbys like half-shell oysters, spring lamb with mint sauce, and mixed ice cream, but there’s also something called “Chow-chow” for 10 cents, or “Shefford snappy cheese” for 15. Click menu to enlarge. 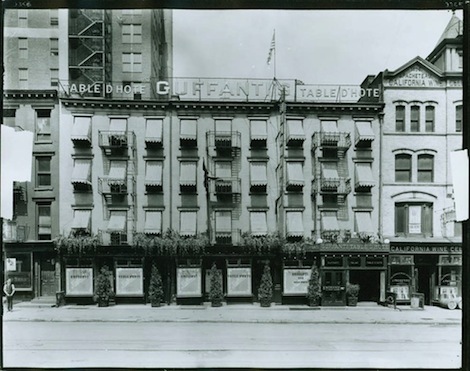 Located on 26th Street and Seventh Avenue, Guffanti’s Restaurant was described as “the most famous Italian restaurant in all of New York” in 1930, which is saying a lot. According to the New York Times, the food was “unique, for nobody else [but Joe Guffanti] knows how to concoct the strange dishes that are prepared there, and Joe never loans out his receipts for cookery.” Each day’s menu was different, and this one from December 14, 1917 featured an appetizer of soup; a choice of fried cod steak, boiled sea trout, a special omelette, or milk-fed chicken (served with spaghetti or salad); and assorted dessert all for a dollar. A “nip of Chianti” was 30 cents extra. Click menu to enlarge. Opened in 1837, Delmonico’s is a New York institution, calling itself the “first fine dining restaurant in the country.” It certainly delivered many of the elements we now associated with fine dining: a considerable wine cellar, private dining rooms, and a house special steak. 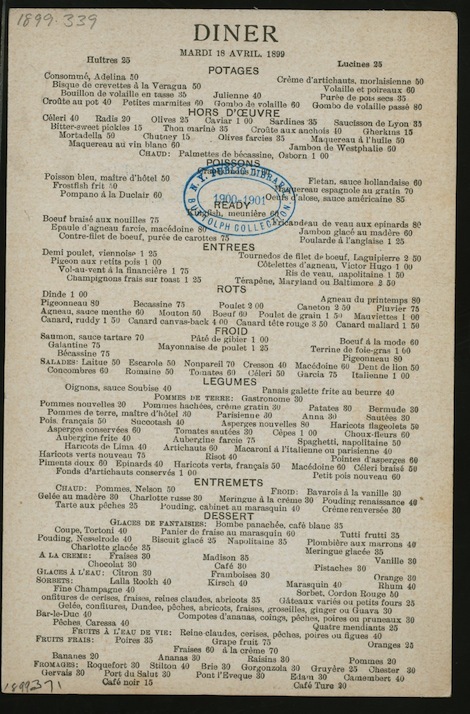 The prices were certainly high-end in 1899, when “Tournedos of filet of beef” would set you back $2.50, and a roast canvas-back duck was a whole $4. There were 411 items on this menu, and it was printed in both French and English. Click menu to enlarge.